Little appears to have been spared either. 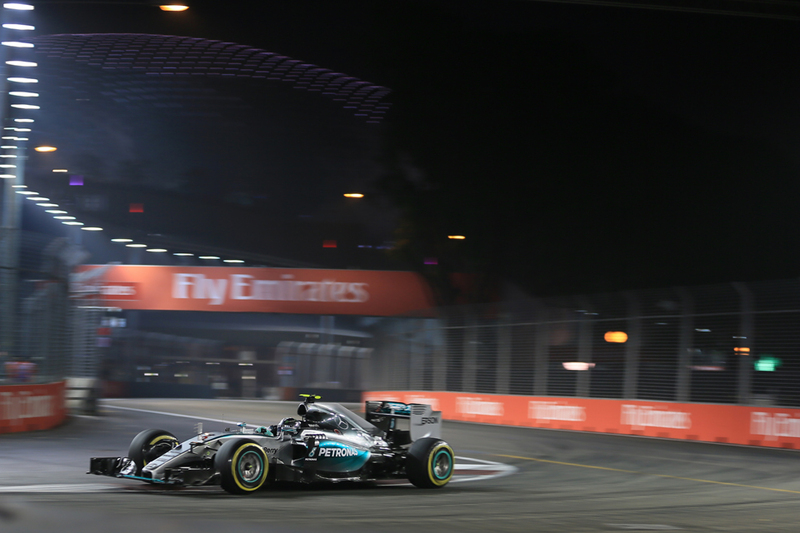 The track goes right past Singapore's most famous landmarks, including the opulent City Hall and Cricket Club as well as going over the Anderson Bridge. Perhaps most importantly it never fails to fully embrace its F1 visit and crowds assuredly are large. And in another way that it is a lot like Monaco, Singapore's is the weekend that everyone wants to be at. Corporate hospitality is booked out and plenty of deals are done here. This goes some way to explaining why, in something near-unheard of, Bernie lately agreed to a reduced hosting fee for this race. 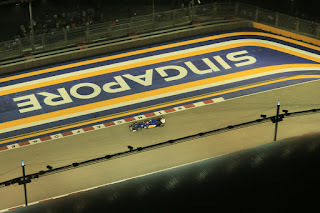 Further when the Marina Bay circuit arrived on the itinerary in 2008 someone somewhere had the bright idea (no pun intended) to make it F1's first night race, taking its cue from other sports which demonstrate that being conducted under floodlights somehow adds to the intensity. And it's hard to cite anywhere more befitting for a race taking place after hours, not only does Singapore boast a fervent night life but the cityscape night time backdrop it provides is stunning. Daniel Ricciardo added indeed in recent days that "being able to drive through a massive city at night with all the lights flashing between buildings as you go past is an awesome feeling. It's weird, I think it actually feels like you are going faster at night." In a further nod to the Mediterranean principality the Marina Bay circuit is a proper downtown street track - all bumps, city landmarks, with nearby walls lining the tunnel-like layout of short straights and regular, angular turns as the circuit goes up and down the local boulevards and highways. But just as Monaco does Singapore also provides challenges all of its own. The event is run not only in 30C heat but more pointedly crippling 70% humidity that seems somehow trapped within the crowded confines. The race nudges, and often goes over, the two-hour limit in an age wherein no other race gets close (Lewis Hamilton once likened a race here to working out in a sauna for two hours). The acrobatic test with almost constant braking and turning means that the driver has scant opportunity for rest. And walls as noted are nearby to punish definitively even minor lapses of concentration. This one represents the year's greatest challenge to mind and body. 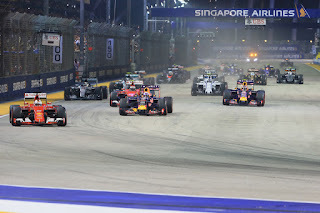 Perhaps underlining the examination that the Singapore race poses only three drivers have won this Grand Prix since it was established: Sebastian Vettel (four times), Fernando Alonso (twice) and Lewis Hamilton (twice). There is another way that it is like Monaco. As with the principality round it's seen as the outlier for on-track form. 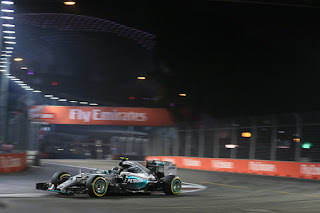 Indeed Singapore is so perhaps even more acutely, as while Mercedes still entered the Monaco weekend as favourite or at least nearly favourite, in Singapore it's hard to suggest even that with confidence this time. Yes on the face of it - with the silver cars only failing to win once this season and that was when the pair took each other out - it sounds very silly. 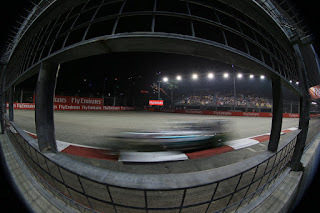 But last year at Singapore for one weekend only F1 stepped through the looking glass and the Merc was nowhere. It seemed the softest tyre compounds brought combined with the Marina Bay track's peculiarity combined to catch the haughty car out. And no one at Brackley is confident that it's got these problems licked since. "We can't go there with too much confidence because we were miles off last year," said Nico Rosberg after his recent Monza win. "In qualifying it [his gap to pole] was 1.8 seconds I think [actually it was 1.5 for him and 1.4 for Lewis], which is huge. It was our most difficult race of the last two years. So it's going to be a very, very challenging weekend for us. "We think we've made progress, but 1.8 seconds, that's not going to be easy [to make up]." His boss Toto Wolff sounded only marginally more confident. "We had a discussion this morning in the briefing about Singapore," he said in Monza, "we weren't competitive last year and I think we understood why. We made some conclusions which have helped us in the following races and throughout the season. And in Singapore we're going to check whether our assumptions were right. "And there is no silver bullet. It's not one thing we got wrong, but many things probably played into each other. This is why I'm really curious and excited to see how Singapore's going to work." Meanwhile Hamilton believes the race could provide the chance for one of the Mercedes drivers to make hay in the title fight - there are but two points between them - by getting other cars between them. "Last year was difficult, and we're hoping this year is not going to be the same," he said. "If Ferrari are closer and more competitive then that's not such a bad thing. The possibilities are there for space between us, and Nico would say the same thing." With this Merc's closest rivals have had this round circled in their calendars for a while as an opportunity for a rare win. 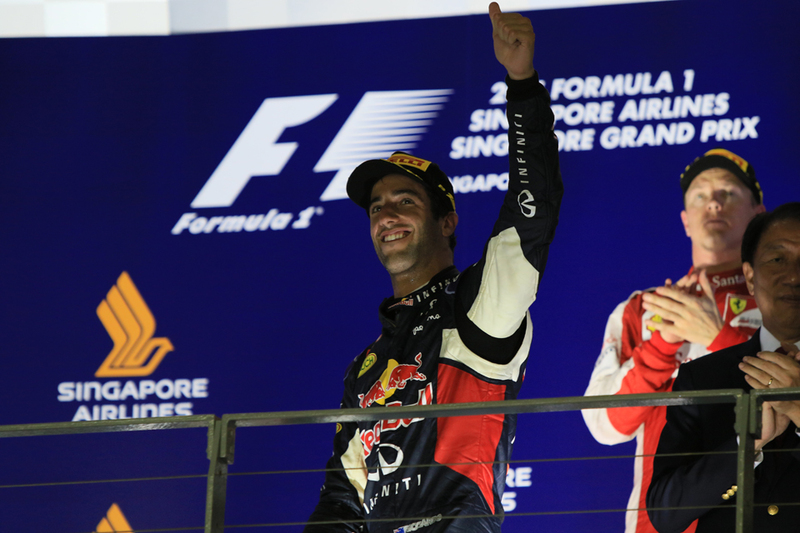 Can Daniel Ricciardo go one better than last year? Chief among these rivals will be Red Bull, which has been in much improved form lately (aside from Monza where the track layout could have been designed to impede it) and might even have circled this round as a victory opportunity even without Mercedes's peculiar woe here. Red Bull boss Christian Horner sounded chipper on the subject in Monza. "We are in a better position than we were 12 months ago" he said. "We have still some way to go to close that gap but we know there are circuits coming up that should hopefully suit more the characteristics of our car. "Singapore, Malaysia, Japan and Mexico, theoretically, are all tracks that should be reasonable for us." And the Red Bull even in its difficult couple of years did well at this circuit. In 2014 it bagged a double podium finish while last year Ricciardo chased victor Vettel for all he was worth and some reckon he may have won without safety car interventions dictating the timing of tyre changes, as his degradation was lower than the Ferrari's. The maximum downforce requirements here suit the Red Bull just fine. Horner added too that Renault might well have a well-timed power unit upgrade. "We have a few little bit and pieces [new for Singapore], and I hear there may be a couple of tokens spent as well [by Renault]" he added. And what of Ferrari? As noted it won here last year and Vettel is quite the local specialist. 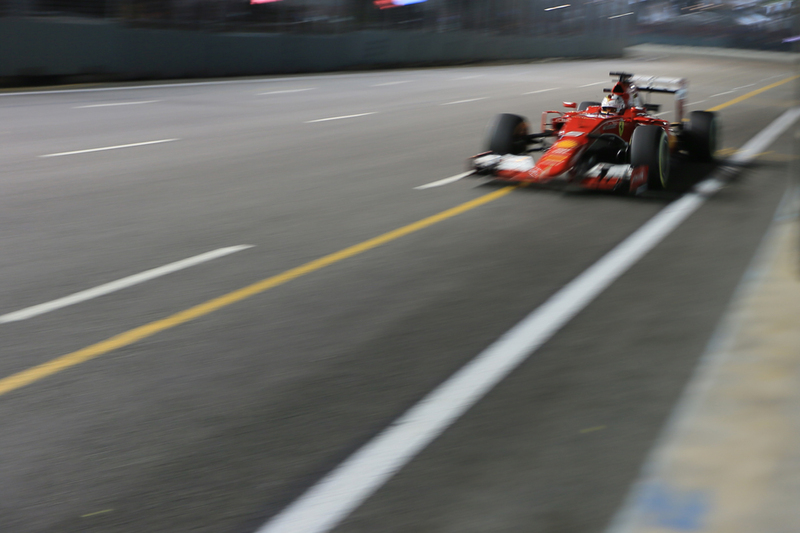 The red cars have appeared to have had a mini-upturn since the summer break, something boss Maurizio Arrivabene attributed to the technical reshuffle that took place a few weeks ago. Not everyone's so sure though as it might be down to track characteristics, with fast Spa and Monza flattering its car a bit. Whatever though, as with Red Bull this one likely represents the team's best chance of a win in a good while. fine form of last year's event? The Scuderia won't be the only one looking at this weekend as a glaring opportunity for a better than usual result. A few others, particularly those without Mercedes power, will be too. This includes not least the McLaren Hondas, which have a chassis that is strong at low speed and the short straights should be good news for them also. Alonso meanwhile thinks things are looking up for the Woking team more generally. "The car I think is capable to be in Q3, both McLarens, both in the points, every single race from now on," he said of the post-Monza part of the year. "I think Singapore, Suzuka, Austin and especially Abu Dhabi we will be very good". As noted Alonso is also one of only three to have won here. Yet even with all of this, we very rarely get rich writing off the Merc in advance. 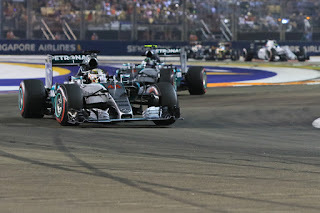 Hamilton as noted is one of the few Singapore winners and Rosberg also appears to specialise in the Marina Bay track's challenges. Even in his days driving recalcitrant Williams and Mercedes up to and including 2013 Nico's results here read as P2, P11, P5, P7 and P5. And that P11 in 2009 should have been a P2 as he looked well on the way to finish there only to cross the pit lane exit line after a stop, and then having to serve his penalty after the bunching of a safety car period, losing him several places. 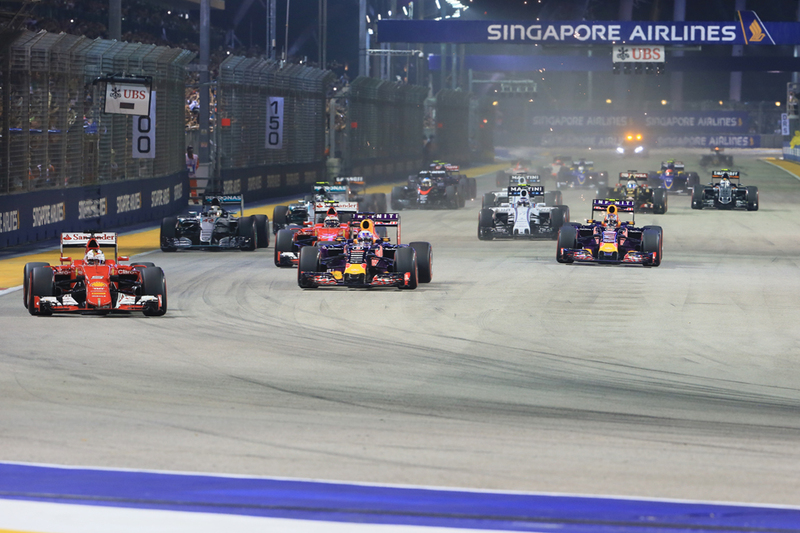 Singapore races never are predictable either, as they come with a few complications. One is that the race often is a battle of survival. We've spoken about the climatic and other local factors and they're not just for the drivers - it's tough on cooling, brakes and much else on the machines besides. Planning too far ahead on strategy in Singapore can be perilous also. The chances of a safety car based on previous Grands Prix actually are 100% and their appearances can ruin a few best laid plans as well as rescue those seeking to stretch things out. Teams will plan actively for when, rather than if, the safety car arrives. Singapore brings a strategy conundrum indeed. Pirelli as usual with the additional compound this season has opted for one more aggressive, and the ultrasoft is available here in addition to the previous supersoft and soft. This track is tough on rubber particularly on the rears with its many acceleration zones, while big pace differences between compounds have been known here too. This all ordinarily would benefit multi-stopping, on the latter point so to minimise your time on the slower tyre. But at this track there are big competing considerations which will push competitors back towards fewer halts. Overtaking is as tough as you'll find anywhere Monaco aside and the field spread is large too, and you can add to this that the pit stop loss time is among the biggest there is - close to 30 seconds - thanks to a lengthy pit lane and a lower than usual speed limit. The safety car appearances we've mentioned also, and they can mess with the multi-stoppers. Reflecting this the field often splits between two and three stops, and look out for some mammoth stints attempted too. We can add also that rain, despite being frequent in the area including on Grand Prix weekends, has somehow always dodged the actual running here. The effect of rain under the lights, such as on glare and the like, is unknown territory. Whatever is the case though make sure you're plugged in this weekend for F1's very own light fantastic. 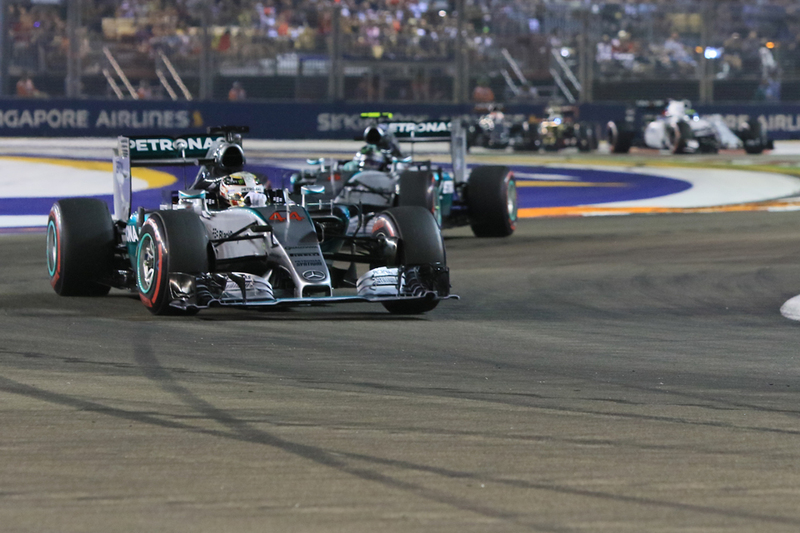 However inevitable F1 appears right now, little is inevitable in the Singapore Grand Prix. Little, that is, besides unpredictability.